Remember the story from June about Amazon recruiting indie booksellers to promote and sell the Kindle? It turns out that wasn't as crazy of a rumor as it appeared, because Amazon just went public with the program. They've issued a press release for a new program called Amazon Source, which according to Amazon will make it "easy for independent bookstores and small retailers to earn additional revenue by selling Kindles". The program builds on the tech Amazon developed for their partnership with the UK bookseller Waterstones. That deal was announced in May of 2012, and effectively made Waterstones a sales agent for Amazon. The new program will do the same for indie booksellers. 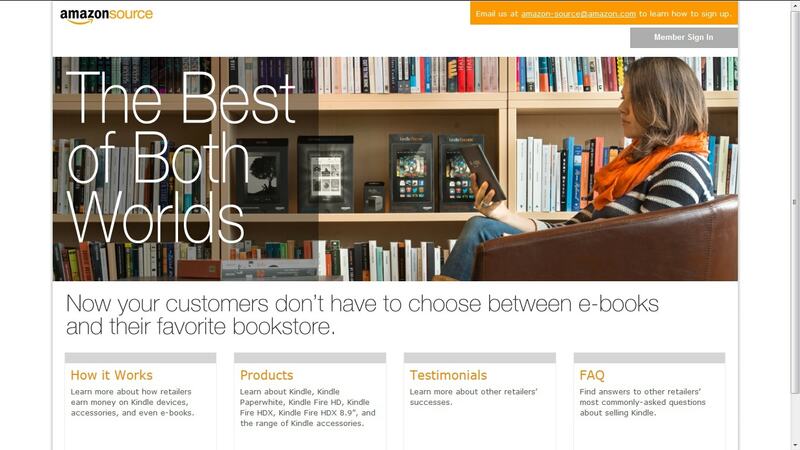 Booksellers will be able to sell Kindles, Kindle Fires, and accessories in store (at a 6% to 35% markdown). They'll also earn a 10% commission on the ebooks purchased via the Kindles they sell (for up to 2 years). The retailers can also buy the hardware at a deeper discount (9%) but they'll have to forgo the 10% commission. Curiously enough there's no mention of whether the booksellers will earn a commission on other digital content: apps, music, video. Update: And that is because this program doesn't include a commission on anything other than ebooks. One day when I was supposed to be pumping out freelance assignments and doing the laundry, on a whim I called Kobo when I couldn’t link my Kobo Mini to my local bookstore. I was having trouble following the directions my local bookstore had given me. I had been told that I could go onto the Kobo website and manually link my Kobo Mini, but there was no link to do that. I also wondered if my Kobo Mini was automatically linked up already. The Kobo customer service agent told me that there was only one guaranteed way to link the Kobo ereader with the affiliate: Create a new Kobo account from the affiliate’s website by clicking on the official link. I'm not too worried about Amazon making a similar mistake; their tech usually works better. Amazon already has a couple bookstores signed up, including a college bookstore and an indie bookseller (both in the Seattle area). These 2 bookstores are the only ones mentioned in the press release and on the Amazon website, so I would bet Amazon doesn't have any other booksellers signed up just yet. so i got a phone call today from a representative of Amazon! apparently, he was given the task of reaching out to independent bookstores in order to ‘build’ a ‘relationship’ with the indies in order to ‘partner’ with us in a program to sell Kindles in our store…yea, really. so, in my most incredulous voice i asked him if he was serious and stated flatly that we wouldn’t be interested. -the Kindle has to be open source. -Amazon has to stop its predatory business practices such as undercutting the prices of an entire market of products (books) that they themselves do not depend on for revenue and/or creating sleazy apps that encourage people to buy from Amazon while they’re actually standing in a bookstore. -and three, Amazon needs to start paying sales tax in all 50 states of the union and stop sucking all the money out of every community they infiltrate. A miniscule number of bookstores will avail themselves of this. I’m anyway a great skeptic of physical bookstores trying to sell ebooks, one is reminded of the desperate attempts by Kodak and others to make digital and analog photography ‘fit’ together. Of course Amazon loses nothing by this. It is an attempt to infiltrate one of the last few heavy reader holdouts from both Amazon and ebooks, the patron of the independent bookstore. Of course, to play devil’s advocate, this means the bookstore could potentially earn a cut of every book the Kindle owner buys, as long as they do it from the Kindle device they bought. Including books that are bought in other locations and would otherwise have been bought from other bookstores. And I’m sure there are bookstore patrons who want to support their favorite bookstore but just don’t want print books anymore; this would give them a way to do that. – 10% of list is 35-50% of Amazon’s typical share of ebook revenue. – The program is excellent, and cheap, anti-trust insurance. Especially if the bookstores refuse to play, as Amazon gets the best of both worlds. – Best way to see if Amazon really wants/needs to recruit revenue-sharing partners is to see if they offer it to retailers that would accept the deal eagerly, like Best Buy, Gamestop, or the Telcos. OK, this is interesting. Engadget claims that the 10% cut on e-books only lasts for two years from the device’s purchase, but I couldn’t find anything anywhere on the Kindle Source site stating that. It was there. I saw it. Is this an exclusive program? Can the bookstores sell both Kindle and Kobo? I haven’t found any sign that this program is exclusive, so it is entirely possible that some bookstores will choose to sell both. The Source FAQ page specifically says it’s not exclusive, and that Amazon feels it’s beneficial for people to be able to compare competitors’ devices. Have to say that the stipulation of the 10% cut on e-books only lasting for two years shows that Amazon is interested in one thing only, namely to wean customers away from independents. To paraphrase a famous dissent, frequently an issue of this sort will come clad, so to speak, in sheep’s clothing … but this wolf comes as a wolf. What isn’t clear on the 2-year limit is whether the commission is based on the device purchase or the customer’s ongoing ebook purchases. If it’s based on the device purchase, then the 2-year limit makes a lot of sense for the retailer: they can encourage customers to refresh their technology with each new model year. I suspect, though, it’s based on the customer’s ongoing ebook purchases.